And on the third day, a marriage took place in Cana of Galilee and Yeshua’s mother was there. However, both Yeshua was invited and his disciples, to the marriage. The ignorance of the Sanhedrin. From 1:19 we learn that its members – by John simply referred to as the Jews, but in verse 24 more closely as the Pharisees – had to send priests and Levites from Jerusalem to enquire about John, Yeshua’s forerunner, who he was. Their ignorance is made still more evident by the pathetic statement of the Baptist: Among you stands one whom you don’t know (verse 26), confirming the tragic truth of verse 11 >> He (Yeshua) came to the own things, and the own ones did not take him alongside. Israel’s religious leaders were so blind that they neither knew their Messiah of God stood in their midst, nor recognized his forerunner to whom the Old Hebrew Scriptures bore explicit witness. At that time, Judaism had become but a dead husk, the heart and life of it were gone. Therefore, it had to be set aside and something completely new had to bring in, as also Saul of Benjamin later wrote in his Letter to the Galatians: But when the fullness of the time came, God sent forth his Son (Ga 4:4). And according to Luke 16:16, Yeshua himself would say later: The Law and the Prophets [are] until John; since that time the kingdom of God is preached as good tidings, and each makes his way inside. ● And the vine said to them, Should I give up my new wine, which rejoices God and men? (Ju 9:13). The central thing about the wedding feast: The wine! And exactly that had ran short. How striking what we have here in John 2! How accurate the picture! Judaism then still existed as a religious system, but it did not minister comfort to the heart. Instead, it had degenerated into a cold, mechanical routine, utterly destitute of joy in God. Israel had lost the joy of their espousals. In accordance of that fact, Yeshua’s mother here occupies a prominent position, to be viewed as a representative character. In this chapter, she occupies the same position as the Baptist did in John 1. She stands for the nation of Israel. Inasmuch as through her the long promised “seed” had come, Mariam is to be regarded here as gathering up into her person the entire Abrahamic stock. Obviously, a pointed rebuke for her failure to render him the respect and reverence which, as the Lord of Glory, were his due. Her actions on this occasion were in accordance with the representative character she here filled. Her unwonted interference was prompted by a carnal motive. She wanted her son to openly display his power and glory, and, accordingly, at that moment she was a true representative of the Jewish nation. Israel had no thought and had no heart for a suffering Messiah; what they desired was One who would immediately set up his kingdom here on earth. Thus, in Mariam’s ignorance - at that time - of the real character of Yeshua’s mission and in his word of rebuke to her, we have added evidence of the typical significance of this scene at the Cana marriage-feast: The setting aside of Israel after the flesh. Now there were lying six water jars of stone according to the purification of the Jews, having space for two or three measures. Again a portrayal of Judaism! Six is the number of man, for it was on the sixth day man was made, and of the the Lawless One, the coming ‘Superman’ of the End Times, the Beast of Revelation 13, it is written: Let him who understands calculate the number of the Beast, for it is a number of a man; and the number of him 666. Yes, there were six water jars standing there, not seven, the perfect number. All that was left of Judaism was of the flesh; YHWH Elohim was not in it. As we can also read in John, the feasts of YHWH were now only the feast of the Jews. Compare Le 23:2 and John 5:1; 6:4; 7:2 and 11:55. Lamentations 4:1 >> How the gold that shines becomes dim! Profoundly significant, then, were these water jars of stone. 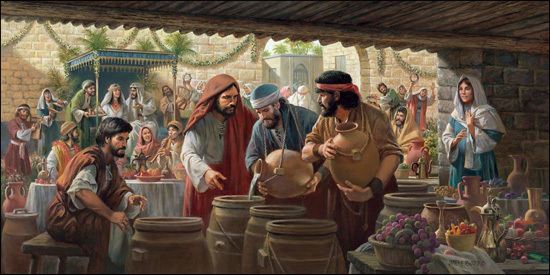 Yeshua said to them,“Fill the water jars with water.” And they filled them until the brim. And he said to them, “Now draw [some] out, and take [it] to the master of the feast.” So they did. Above we have reasoned out the typical significance of the scene at the marriage-feast in Cana: The (provisional) setting aside of Israel after the flesh in YHWH Elohim’s purpose. Saul of Benjamin would afterwards – in his Letter to the Romans (Chapter 11) – argue that Israel after the flesh in the First Century experienced a partial hardening, until the fullness of the Gentiles has come in (verse 25). Therefore, in accordance with that hope we may expect also a future, prophetic application! The miracle, which Messiah Yeshua performed at Cana, possessed a prophetic significance; it looks beyond the conditions that obtained in Israel at that time. As is often the case with biblical events, there is a direct application, but also a fulfilment in a then distant future. As we saw above, John 2 opened with the phrase And on the third day. So Elohim’s spirit presents to our view a third day scene. In Elohim’s inspired Word the third ‘Day’ is the Resurrection Day. And God said, “Let the waters under the heavens be gathered together into one place, and let the dry land appear,” and it came to be so. And God called the dry land Earth, and the gathering together of the waters he called Seas. God saw that it was good. And God said, “Let the earth put forth grass, herbs yielding seed, and fruit trees bearing fruit after their kind, with its seed in it, upon the earth,” and it came to be so. And the earth began to brought forth grass, herbs yielding seed after their kind, and trees bearing fruit, with its seed in it, after their kind. Then God saw that it was good. And there came to be evening, and there came to be morning, a third day. For the sons of Israel will be many days without a king and without a prince, and without a sacrifice and without a pillar and live without an ephod and teraphim. Then the sons of Israel will return and look for YHWH their Elohim, and for David their king; and trembling they will come to YHWH and to his goodness in the final part of the days. So, when the Third Day dawns, Israel’s renaissance shall come. Though now very near, that rebirth is obviously still future, for the establishment of the political State of Israel in 1948 was of course not the fulfilment of Hosea's prophecy. Compare the argumentation for that these in our study: The State of Israel in danger? So, the phrase And on the third day, a marriage took place in Cana of Galilee in John 2:1, presents us with a prophetic foreshadowing of a bright future, following the ‘Two days’ (two thousand years) of Israel’s dispersion. Behold, the days come, says YHWH, that I will make a new covenant with the house of Israel, and with the house of Judah. Not according to the covenant that I made with their fathers in the day that I took them by the hand to bring them out of the land of Egypt; which my covenant they broke, although I was a husband to them, says YHWH. But this is the covenant that I will make with the house of Israel after those days, says YHWH: I will put my law in their inward parts, and in their heart will I write it; and I will be their God, and they shall be my people. And they shall teach no more every man his neighbour, and every man his brother, saying, Know YHWH; for they shall all know me, from the least of them to the greatest of them, says YHWH. For I will forgive their iniquity, and their sin I will remember no more. This beginning of the signs Yeshua did in Cana of Galilee, and he made manifest his glory; and his disciples believed in him. Thus the best wine will be reserved for Israel until the last. However, will all those who are ‘Israel’ manifest that they are really Israel? Will they – fulfilling Hosea’s prophecy - return and look for YHWH their Elohim, and for David their king [of course, the Greater David, Messiah Yeshua]? And will they come trembling to YHWH and to his goodness [which he exhibits in his dear Son] in the final part of the days? How can they do so? Concerning our commentary on John 2, we are greatly indebted to late Arthur Pink and his study of the Fourth Gospel.